Passive infra-red detectors activate on any movement. A shadow moving across the room or if a curtain or mobile hanging from the ceiling moves it will activate the alarm system. Mice, rats the most common spiders and moths will cause P.I.R's to activate. It is recommended that you spray regularly around the detector and ensure there are no spider webs. A strong light or the sun shinning directly on the P.I.R may also cause it to false alarm and if the P.I.R's infra-red rays penetrate a window then any movement outside will cause the alarm to activate. 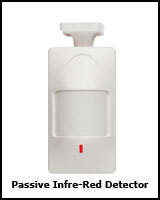 Dual Technology Dectectos (Dual Tec’s) are less likely to false alarm because they require both body heat and movement to activate. If a window is open and the curtains moves with the breeze this will not activate the alarm system however if a brick was thrown through a window it may not set the alarm off because the brick does not produce body heat. If this is a concern then a glass break detector within the room will activate immediately with the sound of shattering glass. If a ray of sun shine, shines through a windows and penetrates a detector for a length of time, it can also activate the alarm system. Whilst this is a rare occurrence, it has the tendency to occur only at certain times of the year. It is also recommended that you spray regularly for insects such as spiders and moths because if they sit on a detector for a length of time or spin a web around the detector they will activate the alarm system. Pet Immune Dual Technology Detectors allow an animal less than 45KG to roam freely throughout the house without activating the alarm as long as they stay on the floor. 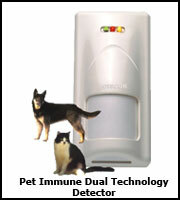 If a dog or cat jumps up onto a chair or a bench for example they will set the alarm off. 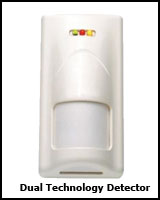 The pet immunity function of the detector allows an area (called a corridor) up from floor level where the detector does not see therefore it will not activate the alarm system.